I am 9 weeks into Marathon training. Almost half way through training for the Niagara Falls Marathon, which takes place at the end of October. The last three weeks were a wild adventure in training that essentially wrapped up the Summer training season as I am know returning to a regimented work schedule, which always creates a challenge with balance of my other lives (husband, father, drummer, professional, amateur chef etc etc). However, as I reflect on the last three weeks, I am quite proud of the resolve and dedication that has been shown while training for the marathon. I believe the part of the reason that I have higher motivation to exercise and get on my running shoes or on my bike is the realization that I have a higher motivation as a goal. I am not just running the Niagara Falls Marathon in October, but I am running the Niagara Falls marathon in memory of my beloved uncle, Brian Smylski, the former executive director, curator and founder of the Niagara Falls Children’s Museum, as well as the executive director and curator of the Niagara Falls Art Gallery after losing a battle with Non-Hodgkins Lymphoma. Losing anyone to cancer hurts but my uncle was my kindred spirit. I looked like him, followed a similar path to him, remind people of him and developed a close relationship at a time in my life when I needed that relationship. I think about him often and cherish the memories that I have, but I want to keep his memory, his efforts and his legacy alive in the Niagara region. So, running this marathon in my home town, where he lived, where the museums are located to raise funds to support the educational programs he helped found, develop and implement sounds like a great way to keep his memory alive! So, I have a moral purpose for training. I am following a pretty good training schedule that I have developed from a variety of sources, focussing on running, cycling, stretching and pilates. Over the last three weeks, my distances on the bike and running have increased and my body feels like it is adjusting the constant stress of pounding. Only time will tell if it will hold out in the long term. Started off week one completing in a team triathlon in Beautiful Bala Ontario with friends and family. I did a 30K bike and a 7 K run in 1:38:21. The run was a bit slow but the bike was great. Took the next day off to recover. Then ran 8K at a 5:20 pace, followed by a 44K bike at a 2:14 pace. Next day, I rant an 8K run doing negative splits (running faster each K) at a 5:15 pace and then had a nice easy 6K run at a 5:21 pace. This week I felt great. I exercised mostly in the mornings and had decent weather and was able to take much time to stretch and foam roll after all exercise, paying special attention to my IT bands, my quads and my hamstring, which can become tighter than my dad’s wallet!! Long run was 19K. It was slow. And long! 6:21 pace. My IT bands hurt bad and created some jarring knee pain at 17K that slowed me down. A big concern for me is my IT bands when I pound the pavement this much! Stretching and rolling helps, but I am concerned that if they continue to flare up, my desired time of 4 hours won’t be attainable! Next day was off (thank goodness!) I think went for a lovely 36K bike ride at a 1:58 pace. Took the next day off to prepare for the longest bike ride of my life! Next day I rode 94K in 3:18:00 on the 70.3 Half Ironman bike course in Muskoka, where you essentially ride your bike around the Lake of Bays. Heaven help me! It was long, hilly, hard and did I mention hilly? My bum. Mu back. My neck. My goodness!!! The next day was a well deserved day off before I did an easy 6K run at a 5:57 pace. The highlight of this week was obviously the 94K ride, proving to me and to anyone else that anything is possible! The smartest thing I did last week was take it easy after the 94K ride. The dumbest thing I did last week was ride my bike 94K a few days before our next team triathlon in Ennismore with family and friends!! I only rode my bike while my wife swam and ran, which is her first running event since an injury sidelined her close to 9 months ago (way to go Ging!). The bike was a struggle. My time was decent. I was happy (1:55 pace) but my legs felt tired! And then, I ran 21.3 K 90 minutes after the bike ride. It was the longest distance I ever ran and at 18K, my knees and IT bands were aching and hurting, but I take that as good news as they are aching later and later…..maybe there is hope! I took the next day off and then ran 6K at a blistering (for me) 5:09 pace doing negative splits. I started hill training the next day, running 5 hill repeats at 85%. I love hills. I could do hill repeats over and over all day long. Love the challenge and how it forces us to run properly and avoid heel striking and shin splint development. Next day hoped on the bike for a 28K ride, which was a nice warm up for our weekend away in Mt. Tremblant where my wife, myself and friends volunteered at the Ironman event. Before we talk about the event, lets talk about the course. I rode the 90K bike loop with friends in 3:15:00 at a 2:10 pace. It was awesome. Beautiful, rolling hills, beautiful landscapes but not nearly as challenging and cuss word inducing as the 70.3 bike course in Huntsville/Muskoka. Now, the Ironman. It was AWESOME! Had such a great time. Got to see a wide range of athletes of a variety of calibres competing. We volunteered together and brought enthusiasm, energy and support to the riders that came through our station. We loved every minute of the weekend and I am so inspired to do this event….when I am 65 and have all the time in the world to train for it!!! Oh, yah. I also need to learn how to swim longer than one 10 metre length without sinking…. So, I head back to work. That means running after supper and after the kids are in bed. That means late night snacks, two showers a day, hydrations issues, sleep issues, televisions issues….but that is the price you pay for exercise. It interrupts your life because exercising becomes your life!!! Can’t wait to see what the next few weeks bring. Will my knees hold out? Can I avoid injuries? Will my IT bands ever not hurt? Why does foam rolling make me cuss? Is porky pig anatomically incorrect or just wearing pink spandex pants? Training to run a marathon isn’t easy. Many of you reading this may have run a marathon. You know it takes time, effort and can be hard on your body, mind and spirit. What I find one of the most difficult parts of athletic training (taking into account bike training, duathlon training and marathon training that I have done in the past year) is diet! The food and fuel that I consume pre and post exercise has certainly changed in the year that I have dedicated to becoming more active. Food choices have definitely changed for the better. Not that I didn’t eat well, it is just that my eating has become more refined and am now eating things that are better and healthier for me. I am going to break down food into 4 categories and explain how they have changed. I am a product of the sugar cereal generation of the 80’s and 90’s. Frankenberry, Boo-Berry and Count Chocula are my favourite. (However, they don’t sell these cereals where I love and god bless my family who stock up on these cereal at Halloween and offer them as gifts at Christmas). However, now I have replaced cold cereal/toast/juice for breakfast with oatmeal covered in a mixture of berries, greek yogurt and chia seeds, a protein shake (almond milk, pomegranate juice, frozen fruit, bananas, avacado, spinach, protein powder, flaxseed, chia seeds) and some toast. I noticed a big difference as I am now less hungrier earlier in the morning and stay ‘full’ longer into the day. When I work, I am guilty of not eating my lunch. In my profession, lunch is my ‘busy time’ and it is often hard to eat any (not just all) of my lunch. That is my one goal when my vacation is over. I need to eat lunch. Lunch is also difficult because I don’t really like sandwiches! So lunch can be very creative. Eating after a workout, I usually eat a fried egg on a bagel with spinach, tomato and avacado followed up with some greek yogurt and a glass of water or two. That will be hard to replicate at work so I need to figure out a way to eat my lunch but to pack things that I want to eat!!! We don’t eat out of a box. We eat a lot of fresh food and all dinners are made and not just turned on. We no longer eat lettuce as it is replaced with spinach. We have started to eat more leafy greens (Kale, Chard) and more of a variety of vegetables (beets, beans) and more legumes (lots of lentils). I have been a long time vegetarian so we have a variety of recipes that we rotate through to make sure we are eating a variety of foods. I love making soup and when I take the time to make something that is delicious, it often slides into dinner rotation (like the roast beet, peach and goat cheese salad) and becomes a regular dinner time staple! I like potato chips. Nope. I am wrong. I I think I may LOVE potato chips. However, when I sit down to eat some chips, I don’t have a lot of will or resolve to have a few. I can down a family sized bag in less than no time (more or less). However, the next day, when you go to exercise, you feel AWFUL! so, I have replaced my potato chip snacks with a variety of healthier snacks. Apple sauce, yogurt, crackers and hummus, a bowl of cereal (Jordan’s is my new favourite) and of course, the cliff bar, lara bar and uber bar have become the snacks of choice. They are like chocolate bars for athletes! Welcome to Chapter Six of my marathon training! As many of you know, I am training for my first ever marathon, the Niagara Falls marathon, at the end of October. I am running the marathon in memory of my uncle, Brian Smylski, the former curator and executive director of the Niagara Falls Children Museum, who died in 2011 from Non-Hodgkins Lymphoma. I have decided to blog as a way to track my journey and inform others about marathon training, my motiviation to run and to help raise funds for educational programming for the Niagara Falls Children Museum. Any help to spread the word, would be much appreciated. My last blog post focussed the aches and pains of running and ways that I have read, researched and am using to ensure that I can reduce the pain, the wear and the tear on my body when I am training 5-6 days a week to run a marathon in close to Four hours! In the meantime, I continue to cross train to help alleviate the ‘wear and tear’ of the continuous pounding of the pavement of my knees. I am riding my road bike in addition (and in substitution) of running. Riding the bike is also good for my team triathlon training, as my wife and I are registered in three additional team triathlons of a variety of distances this Summer (she swims, I ride the bike and run). I have found that cross training is helping my running times, especially when I am doing tempo runs or running negative splits (running kms where each one is faster than the previous kilometre). Day One: This was the first time since I ran 10 miles last October that I have run longer than 13K. I ran 16K in 1:40 at a 6:18 pace with a heart rate of 133. A nice long slow run. My knees started to hurt at 13K. This isn’t good!!!! Day Two: Off – I didn’t run or bike but spent some time doing core strength exercises and Pilates. The stronger your core is, the easier it is to keep good running form, which means that running longer distances will become easier!!! Day Three: Today I did a BRICK workout, where I biked and then I ran. I biked 26.54K in 53:32 at a 2:01 pace with a heart rate of 145. That was immediately followed up with a 5K run at a 5:19 pace with a heart rate of 152. That was some work out! A great bike ride, filled with hills and some inappropriate language that would make my grandmother blush. Surprisingly, the run felt great! A good sign considering my knees hurt yesterday! Day Four: Hills! Anyone else love running hills? I like the challenge. the challenge to keep my form, the challenge to keep up my effort, the challenge to make the next run up better than the previous run. I am blessed to have LOTS of hills near my house to run. I chose one that is 3K away. A nice little 3K warm-up and cool-down after running 3 hill repeats! Day Six: A nice 6K negative split run, where each Km is run faster than the previous one! Did 6K in 32:10 with a 5:18 pace and a 149 heart rate. Running negative splits is my new favourite workout. It pushes your threshold of pain, pace and effort to a new level. Remember, to fun faster, you need to…RUN FASTER!!!! Day 7: An easy run. 5.87K in 31>08 at a 5:18 pace. A great run with a great feel. I didn’t need to ‘push it’ but felt great and natural running at this pace. However, the next day, my knees hurt. A lot! Pain hits you like a ton of bricks! My knees are getting accustomed the pounding of running longer distances. My body is used to running 10K or under, but over 10K and that is ‘pushing it’ for my body. My knees hurt, my IT bands become tighter than my dads wallet and the pain starts to creep in. That leads to the self doubt. ‘Can I really do this?’ is the biggest question my mind is asking my body….I guess only time will tell. However, that is a story for next time! When I started training for the marathon earlier this Summer, I knew it would be….uncomfortable. Last year, I ran a ten mile race in the Fall and at mile nine, I had intense knee pain in my right knee. It was like someone stabbed me in my leg it hurt that bad. I struggled with a run walk combination over the last mile to hobble to the finish line. That was more than uncomfortable. That was painful. Here I am, about 9 months later, a little wiser, a little smarter and still in some discomfort…however, it is better now than it was last year. The big difference is a few factors that have helped relive that post workout discomfort (or pain if you want to call it that). 1. Foam Roll. I hate foam rolling. It hurts. It causes me to moan, yell, say inappropriate words that I would blush if I said them in front of my grandmother. But it works. There is emerging research that shows that 10 minutes of foam rolling (aka deep tissue massage) reduces inflammation and can alleviate some of the pain and discomfort you are feeling. I really focus on my IT bands as I discovered this was the source of that stabbing knee pain last year when I ran the ten mile race. 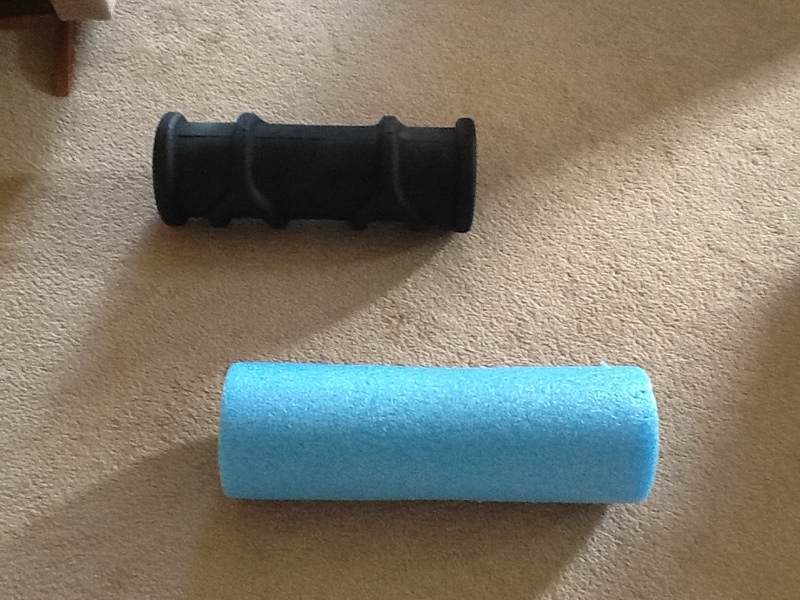 Here are pics of our two foam rollers. The blue one is the kind one. The black “Y” roller is the evil one that I want to hurt! 2. Recovery Drink. When I am completed running, I ensure that I drink a recovering drink or fluid. This can range from chocolate milk, to “Muscle Milk (very high in protein)”, Ultima or G2. I find that it not only quenches my thirst, but helps in my muscle recovery the next day. 3. Drink Fluids during the day – I know when I haven’t had enough fluids in my day when I do a workout, because I am sluggish, slow and laboured. 13 cups a day of water is recommended for men (9 cups for women) and some days that can be challenge! But if I know I am doing a workout, I really work hard to ensure I have 13 cups of water in me well in advance of a workout. It makes that much of a difference! 4. Ice – this has been vital in ensuring that my knees and legs work after a workout. Throw on an ice pack on my aching knees or calf for 10 minutes, it helps dramatically versus the times I don’t use ice after a workout. 5. Protein shakes – Protein powder, almond milk, the blender, leafy greens and frozen fruit have become staples in our house. I swear by the protein shake and having one after a run or before a workout makes me feel better knowing I packed in a ton of food into a blender that I would have difficulty eating but no problem drinking! And it makes me feel good! 6. Sleep – it helps to rest those weary bones, aching muscles and hurting joints. 8 hours a night is recommended (Does anyone besides kids sleep through the night anymore? I know I don’t)! These six factors have helped me focus less on my aches and pains and more on my times and feeling when training for the marathon, which takes place at the end of October 2013. Distance is getting up there and in the back of my mind I wonder if my legs will be able to take the pounding…but that is a story for another time! This week was a scorcher where I live. So very hot and humid. I am certainly glad that I am not working and have some flexibility with training while on vacation. That being said, I also continue to struggle balancing my workouts with the the workout schedule of my wife and the responsibility of parenting two young children. This week, I continue to concentrate on fueling. I have always had issues fueling when running. The issue I have is that I don’t fuel. I don’t like drinking fluids until I am completed a run. I don’t really feel super comfortable wearing a fuel belt. I think gels taste like I threw up in my mouth and I am not a huge sugar fan, so chews are sweet and much too sugary for my taste, liking and sometimes my body (I like to call it the ‘running reaction’. Where you are running and all of a sudden, you have that sudden urge to run to the bathroom!). One days like this week, you have to be especially cognizant of fueling properly to ensure that running in the heat doesn’t have a lasting impact on your immediate health! However, due to the heat and humidity (and safety), I have chosen to ride my road bike as a substitute to running during this hot and humid week. I chose to do this because it forces me to drink fluids when exercising (which I still find difficult to do) and as the distance continues to increase, so does the increasing aches and pains in my legs, especially my knees and IT bands (More on that in my next post)! Day 1. Hot. Did I mention it was hot out today? And humid? Today, I did a BRICK workout where I biked for 60 min and rain for 15 minutes. I really didn’t focus too much on distance but more on time. I am trying to get a feel or working my threshold to ride or run when uncomfortable. Add in the heat and humidity, and working your body at 80% of its capacity, that is an algebraic formula for uncomfortable. Lots of liquids on the bike. No liquids on the run. Did I mention it was hot? Day 2. 12.5Km run in 1:22 at a 6:23 pace. A slow long run at a slow pace on a very hot and humid day. Today was the day to run slow but my mind is having difficulty telling my body to run slow. My mind and my body seem to want to run faster than the intended 6:30 pace. I worry about the long term training on my legs and knees as they are starting to get sore, ache or worrisome at different parts of the run. Day 3. Today I was to do a 6K tempo run with a pace of 5:50. Instead I rode my bike for 19.5K in 40:11 at a 2:04 pace on another hot and humid day. I also did this ride at 2:30 in the afternoon as this was the ‘optimal’ time in our scheduled day to exercise. Did I mention it was hot and humid? A great way to ensure that I am drinking when riding/exercising to help train my mind and body to replenish with fluids regularly when exercising. Day 4.Today is my favourite running schedule day. Hills! I really like running hills. Most people moan and groan but I take it as an individual challenge. A slow 3k warm up and then two hills repeats that are about 300-400 metres on another hot and humid day. I will be the first to admit that this is the first time that I ever ran hills wearing a fuel belt. The water and sports drink were much needed as I was wiped by the end of the hill repeats and then had 3k to ‘cool down’ (no pun intended)! Day 5. I was supposed to do a 8K steady run but instead I hopped on my bike instead. I did a short but hilly 2o k route in 45:28 at a slower than usual 2:16 pace. did I mention that my ride was when it was very hot and humid? The heat and humidity were definitely getting to me and I am riding in a regular cycling jersey. I went home and immediately ordered two lightweight sleeveless cycling jerseys to be cooler when I rode! Day 7. I was scheduled to run but instead I did 1.5 hours of pilates, stretching and core exercises using Youtube and my cool basement as my workout area using videos from the bossy trainer and Efit30. I wonder who I will be able to continue to increase my distance in the extreme heat if it continues as well as how to balance the hurt of my legs and knees. However, that is a story for next time! The best thing about not working is the flexibility. I am officially on vacation and this is pretty exciting for me as training happens a lot after the kids go to bed when I am working. Fitting in exercise while working needs to be a priority, but there are so many hours in the day, and I also need to balance the schedules of my wife and kids to ensure that I can get any exercise in! So, I am now on vacation and this is exciting! One reason is now my workout times can become more flexible than if I was still working. My wife is also on vacation, which makes it even nicer. She is just getting back into running after an injury and is currently re-training her gait when running to ensure she lands on her toes/forefront of the foot and not heel strike (as this was a source of a much lengthy and painful injury that has sidelined her for close to 9 months) so I will work around her schedule when she is running or doing her early morning swims. This week I have had to readjust to running with a fuel belt. I usually don’t run with a fuel belt as most of my distances were shorter (under 8K) and I felt I didn’t need to bring water or fuel with me, so this is a bit of an adjustment for me. I really like the Nathan belt that I purchased from EBay. Two water bottles and a pouch where I put my phone (for emergencies), chews or gels in. This week was my first week off and my first week trying to fit in a variety of different runs. 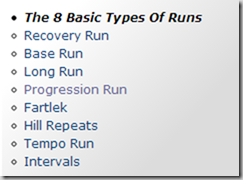 For more information about the different types of runs, check out this running blog that I came across that I really liked http://carrotsncake.com/2013/07/different-kinds-of-running-workouts.html. It helped me distinguish the different types of running workouts. This week, I decided to focus on heart rate, feel and creating benchmarks to establish a base to measure improvements when running since this is my first week of vacation. Over the next few weeks, running workouts will vary to ensure that I can compare to see if growth has occurred. Day 1. Today I am participating in a sprint team Triathlon in town with my wife (she is swimming) and my brother in law (he is running). I am doing the bike leg. This is the first swim for my wife for a triathlon and it happens to be my brother in laws birthday (who is visiting from overseas), so it was a special day. Rain started early but stopped when the swim was under way. My wife had a panic in the water (who doesn’t when swimming their first triathlon) and came out of the water near the back of her wave and I took over. I did a 20K bike in 37:14. A great time. A personal best! Then my brother in law ran with the goal of being under 20 minutes but wore racing flats and didn’t realize that the majority of the course was on wet grass and gravel! He finished at 20:30. A good time had by all. But I still needed a long run, so I put my bike back in the van and ran home. It was a slow pace. 6:27 a Km. I ran 12:23K in 1 hour and 18 minutes. Heart rate was 140. Running slow is hard to do. Generally my body wants to go quicker, faster. I need to run slower to train my body to run beyond the 10K mark and withstand the pounding of the pavement that my feet and knees will be enduring when I run the marathon. I felt great after the run and had a great stretch. Doing pilates and core strength activities during stretching has also allowed me to get my muscles stretched but to improve the strength of my core (The bossy trainer on Youtube has a quick core strength workout and efit30 on youtube provides excellent starter pilates training as well). I highly recommend augmenting your training by doing some core strength exercises and pilates! Day 2. Off. Heck, I am on vacation! Day 3. Today I was to do a 6K tempo run with a pace of 5:50. Instead I did a 6K tempo run with a 5:08 pace. The reason is, I am still training for two to three duathlons / team triathlons and need to have a competitively fast 5k-10k time, so I ran faster! Day 4.Today I am scheduled to do a 10K tempo run that was supposed to be run at 85%. This was a hot day and I didn’t run until after lunch. I managed to run 9K in 51:07 at a 5:41 pace with a heart rate of 149. I felt awful and slow. It was painful. I felt every leg turnover and was not happy about the run. I guess I should cut down on the ‘holiday booze’!!! Day 7. Not a scheduled day off but what would a vacation be without getting ill! A stomach virus has left me in an uncomfortable state and has forced me to cancel my workout (unless you count running to the bathroom)! This week was a crummy week of training. Next week I need to do a better job of running comfortably, try to elevate my heart rate more on shorter distances and monitor it on longer distances. The big question is balancing the training for shorter races with training for the marathon. Ps. Here is a great link to some other excellent running blogs that I recommend you check out!